This Irish snowman features a shamrock on his sweater and he makes a great Christmas decoration. Sorry, this Irish snowman is sold out for the season. 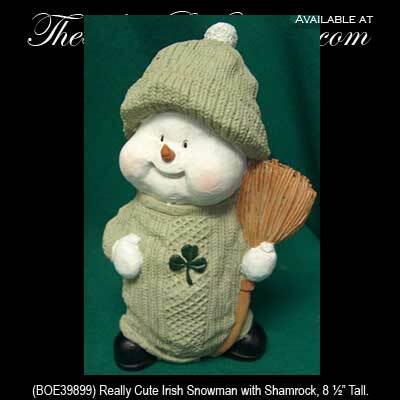 This super cute Irish snowman features a knit cap along with an Aran sweater that is enhanced with a shamrock. The 8 1/2" tall Irish Christmas decoration is made of hand-painted resin and is gift boxed with a shamrock history card that is complements of The Irish Gift House.